The 3 storey Islwyn High School development is located on the former Oakdale colliery site. The school accommodate's pupils from the former Oakdale and Pontllanfraith Comprehensive schools. The 1000 pupil school, plus 50 pupil special resource base, was completed in 2017 by contractor Willmott Dixon and comprises a range of modern teaching spaces, materials workshops, cooking teaching spaces, sports hall. The school also benefit's from a 3G pitch, 200 metre athletics track and multi-use games area as well as outdoor learning spaces and a small amphitheatre. 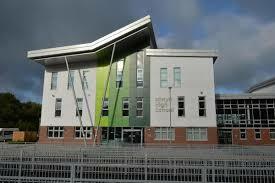 Evans Electrical Ltd were employed to provide all the electrical services within the new school.